This course is designed for home performance professionals, weatherization crew members and building inspectors who use thermal imaging or are considering adding the technology to their array of services. IR for Weatherization and Energy Audits will meet the needs of any building thermographer that is using infrared to inspect residential buildings for insulation defects, air leakage problems and moisture related issues. This course is open to all models of thermal imaging equipment. There are several hands-on simulations and exercises built into the training. While owning an infrared camera is not necessarily required to participate, those who wish to complete the class in its entirety should have access to one. 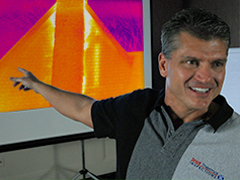 Finishing this course prepares students to start successfully applying infrared technology to inspect residential buildings and small commercial facilities for deficiencies in the thermal enclosure and to locate moisture related issues. What are the minimum system requirements for taking this online course in Litmos? When you initially log in, be sure to provide a "Ship To" address, where prompted, so that we may send you a course manual. Please note, we cannot ship to PO Boxes. Please review these following videos to sample our new online course, Infrared for Weatherization and Energy Audits - Online.